JOLIET – At today’s meeting, the Will County Board recognized an important partnership that will greatly impact Joliet’s housing market. 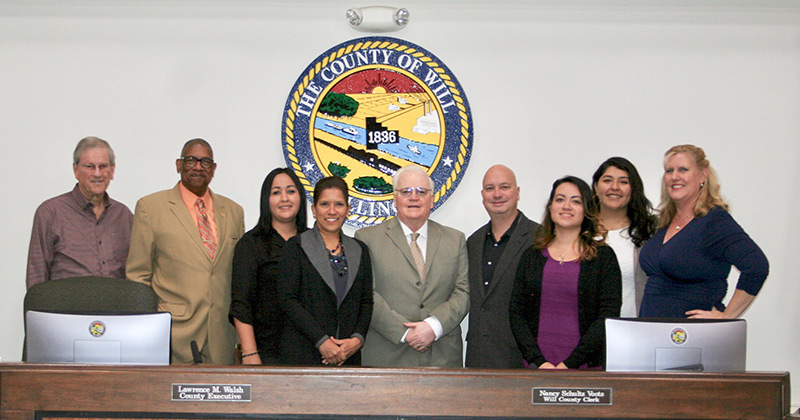 The Community Service Council of Northern Will County and the Spanish Community Center are joining together to form a HUD-approved agency in downtown Joliet that will assist clients with housing and financial literacy. The two United Way of Will County agencies will provide a housing counselor onsite at the Spanish Community Center, Monday through Thursday, to offer services such as rental counseling, financial literacy and education, foreclosure prevention counseling, home pre-purchase counseling, and information about the program Illinois Hardest Hit Fund. Since 1973, the Community Service Council of Northern Will County has offered a variety of counseling services, such as clinical, marriage, domestic violence, and anger management to the local residents. The council is also certified by the Department of Housing and Urban Department to provide housing counseling, at no cost, primarily in the areas of mortgage default and rental eviction. CSC has assisted more than 4,000 families in finding new homes. Since 1969, the Spanish Community Center has offered a variety of “wrap-around services” in both English and Spanish to the Joliet community including: clothing and furniture vouchers, IDHS applications and renewals, employment services, weekly food pantry, housing counseling, and resource and referral program. In 2016, the Spanish Community Center assisted 95 local families and received a top-performer of bilingual housing counseling rating by the State of Illinois as part of the Latino Policy Forum’s Operation HELP.